Later documents mention Vetus Wer(e)ford, (1260), Holde Werford, (1342), and Werford iuxta Olreton (1343), meaning ‘next to’ Ollerton. 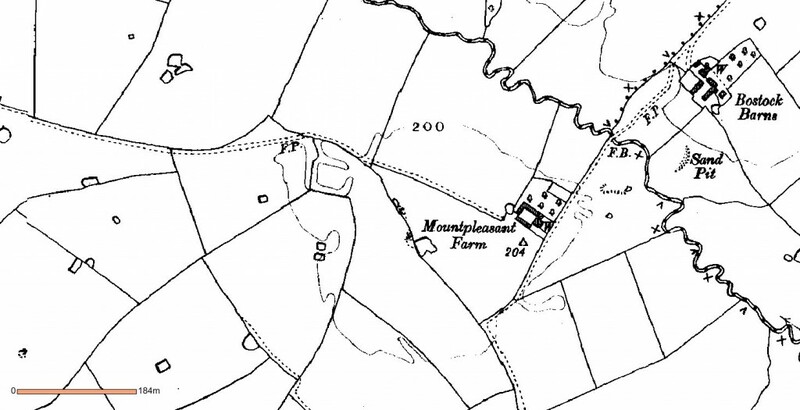 In Dodgsons “Place Names of Cheshire”, he claims that the manorial seat of what we might call Old Warford may have been at Moat Hall, which now lies in present day Marthall. At the time of Domesday Warford was held by Ranulf, ancestor of the Mainwaring family of Peover. It lay in the ancient parish of Rostherne, within the Hundred of Bucklow. 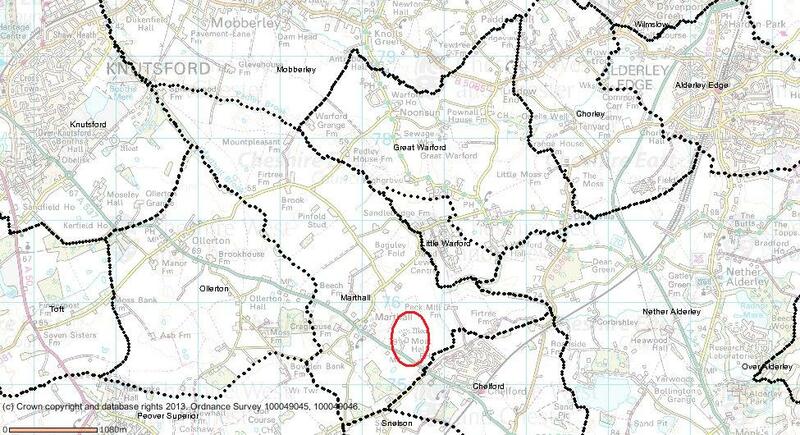 It was divided into two when Roger Mainwaring gave the area now known as Little Warford to Robert de Vernon for military service at the beginning of the reign of Henry II, approx 1220 and at sometime later became attached to Marthall. 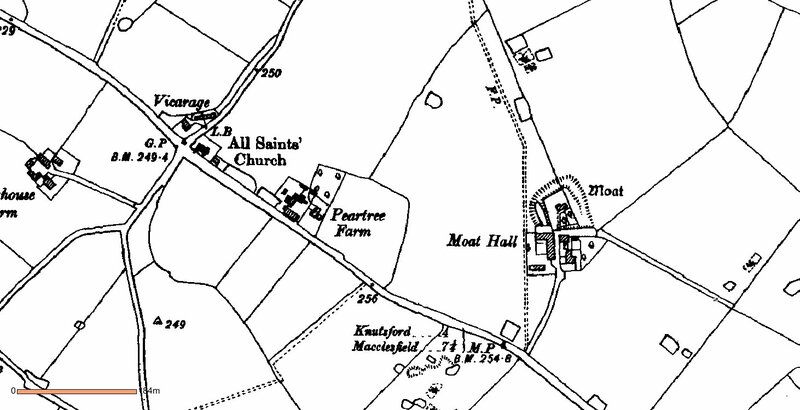 When the Hundreds system was reorganised in the 14th century, what we now known as Great Warford was allotted to the Macclesfield Hundred and became part of the parish of Alderley. Marthall is not mentioned in Domesday but does appear in documents from the late 13th century. 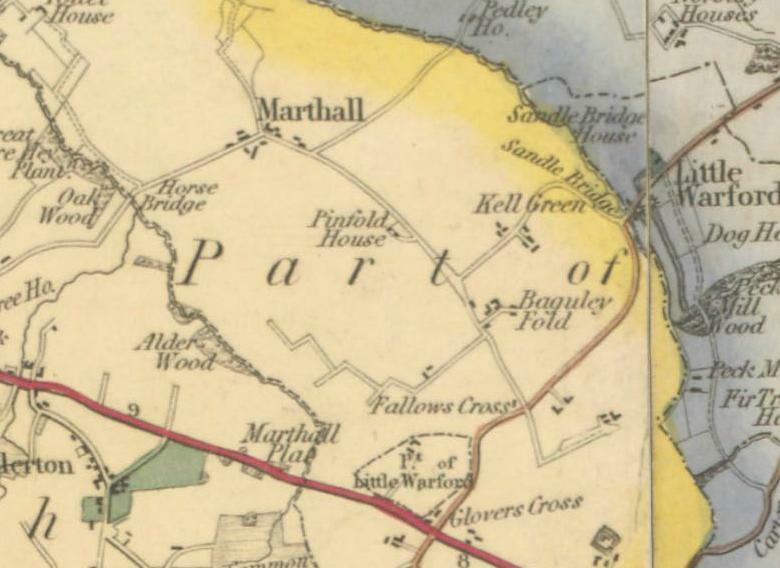 On Bryants Map of 1831 Marthall is marked further north at the junction of Brook Farm and Firtree Farm. Just above here is a moated site, known in 1842 as Hall Hill which may have once contained a medieval manor house for Marthall. The centre of the village of Marthall has since migrated to the main turnpike road, as has Ollerton, presumably to take advantage of passing traffic and hence this is where All Saints Church was built in 1841. 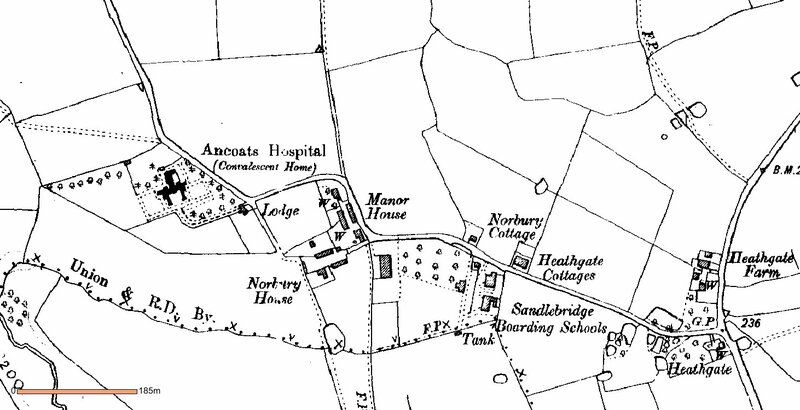 As for a likely location for the manorial centre of Great Warford, this shows the site on Ancoats Lane known as Norbury Houses, which was a large farm complex and Manor House. Originally a timber framed house stood here, which was eventually replaced, and this was later rebuilt and used by the Mary Dendy. The other, perhaps most well known of the manor sites to consider here, is that of Sandlebridge in Little Warford. This grand house built in 1704, was the home of the Holland family who owned much of the land in Little Warford, after marrying into the Colthurst Family. This building replaced an even older house which was lived in by the Colthurst family for 4 or 5 generations. At this time, it had a moat on all four sides, but John Holland had two of these filled when he built this house in 1704. The amount of moated and potential manorial sites can be confusing at the outset; there seem to be quite a number in a small area. Two others can be discounted as having any early manorial connections. The first is the rather grandly named Warford Hall, built in an Italianate style, a much later addition to the village, built in 1867. The second is Manor Farm in Great Warford, which is timber framed, late 17th century, with 18th additions. This has been much confused with the original Manor House at Norbury Houses. On the Tithe Maps of 1842 it is shown as belonging to Peover Church and it is understood that this was built here so the parish could provide a curate for the Church, hence it’s older name, Mainwaring Farm or House.